Cargo volumes at the Port of Los Angeles reached 8,856,782 Twenty-Foot Equivalent Units in 2016, marking the busiest year ever for a Western Hemisphere Port. The previous record was set in 2006, when the Port of Los Angeles handled 8,469,853 TEUs. “The Port of L.A. is America’s Port — and we’re breaking records because we understand the importance of innovating and collaborating to move our economy forward,” said Mayor Eric Garcetti. The Port finished the year strong, with December volumes of 796,536 TEUs, a 27 percent increase compared to the same period last year. A strategic partnership with the USC Marshall Center for Global Supply Chain Management aimed at improving the global competitiveness of the nation’s supply chains was signed by U.S. Commerce Secretary Penny Pritzker on October 14 at the University Park campus. “Through this new partnership, we hope to encourage ports around the country to increase efficiency by adopting new technologies that will provide more information on the flow of goods to port users and stakeholders,” said Secretary Pritzker. Striking Southern California port truckers who accuse shipping companies of wage theft took their grievances on Friday to City Hall in Los Angeles, where they gained new political backing for their cause. 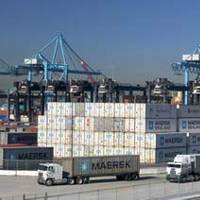 The City Council voted unanimously in favor of a resolution voicing support for the truckers and calling on the companies doing business at the city-owned Port of Los Angeles to abide by federal and state labor laws. The truckers also delivered a petition bearing 27,000 signatures from members of the pubic to Mayor Eric Garcetti's office urging him to weigh in on the drivers' behalf. 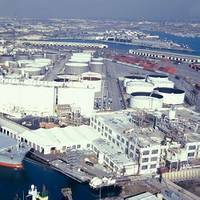 The Port of Los Angeles has entered a long-term agreement with Hecate Energy Harborside LLC, a wholly owned subsidiary of Hecate Energy LLC (HECATE), to build, operate, and maintain photovoltaic (PV) solar power systems (PV Systems) that will generate electricity at multiple site locations within the Port. The PV Systems will feed clean energy to the utility grid operated by the Los Angeles Department of Water and Power (LADWP). "This solar project is a perfect example of our city departments doing their part to adopt my Sustainable City plan," said Mayor Eric Garcetti. Findings from its 10th consecutive year of tracking air pollution show the Port of Los Angeles has set new records for cutting harmful emissions from port-related sources, with diesel particulate matter (DPM) down an unprecedented 85 percent and sulfur oxides (SOx) bordering on total elimination, having plummeted 97 percent since 2005. The data also shows the Port has surpassed its 2014 emission reduction goals set in 2010 for DPM, SOx and nitrogen oxides (NOx). Released today, the Port’s 2014 Inventory of Air Emissions reports NOx emissions are down 52 percent. The percentage fell slightly from the Port’s best year for NOx reduction – 57 percent in 2013 – largely due to congestion experienced at all West Coast ports during fall 2014. 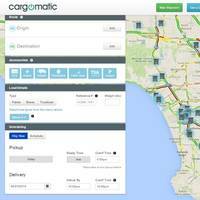 Los Angeles Mayor Eric Garcetti today announced that Cargomatic, a Los Angeles-based, privately-owned technology company that matches trucking capacity with shipments, is testing its mobile app to speed up the flow of containerized cargo at the Port of Los Angeles (POLA). Cargomatic has developed a peel-off shipping concept that it calls the “Cargomatic Free Flow” program, a web-based solution that optimizes container moves for cargo owners, terminals, and trucking companies. Testing began in early January and preliminary results are encouraging, POLA said. International Longshore and Warehouse Union members have ratified a five-year contract governing pay and work rules at 29 West Coast ports, including those of Los Angeles and Long Beach. "Today is a big day for America's number one port -- the Port of Los Angeles. Now that the International Longshore and Warehouse Union and Pacific Maritime Association members have ratified the port labor agreement that we worked on in February, we can now move forward together to make our port the best in the world and keep our economy moving. A group of shipping companies and a powerful dockworkers union clinched a tentative labor deal on Friday after nine months of negotiations, settling a dispute that disrupted the flow of cargo through 29 U.S. West Coast ports and snarled trans-Pacific maritime trade with Asia. The settlement, confirmed in a joint statement by the two sides, was reached three days after U.S. Labor Secretary Thomas Perez arrived in San Francisco on Tuesday to broker a deal with the help of a federal mediator who had joined in the talks six weeks earlier. LOS ANGELES, Feb 18 (Reuters) - Two U.S. Cabinet secretaries joined congressional leaders, three governors and a big-city mayor on Wednesday in pushing shipping lines and the dockworkers' union to settle a contract dispute that has led to months of turmoil and cargo backups at 29 West Coast ports. Labor Secretary Tom Perez and Commerce Secretary Penny Pritzker weighed in as emissaries of President Barack Obama, who has come under rising political pressure to intervene in a conflict that has reverberated through the trans-Pacific commercial supply chain and could, by some estimates, cost the U.S. economy billions of dollars. Worsening cargo congestion that the union and shippers blame on each other has slowed freight traffic since October at the ports, which handle nearly half of all U.S. The Port of Los Angeles continues to make strides in cutting pollution from ships, trucks, trains, cargo-handling equipment and harbor craft, according to the latest annual inventory of emissions from port-related mobile sources. The Port’s 2013 Inventory of Air Emissions shows the Port has set new records with diesel particulate matter (DPM) down 80 percent, nitrogen oxides (NOx) down 57 percent and sulfur oxides (SOx) down 90 percent over eight years of aggressive clean air measures. The U.S. Department of Transportation (USDOT) announced Friday that 72 projects will receive a total of $600 million from the sixth round of the Transportation Investment Generating Economic Recovery (TIGER) program. Of these, 12 Coalition for America’s Gateway and Trade Corridor (CAGTC) member projects were awarded a total of $135 million for projects with full costs exceeding $490 million. One in three grant dollars, just over $198 million, was awarded to 25 projects supporting freight movement. Compared to previous rounds, this represents a decrease in the amount of money and total awards given to freight relative to other types of projects. 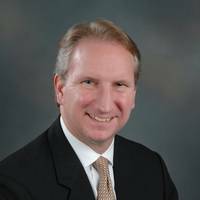 Mayor Eric Garcetti has nominated Gene Seroka, an executive with APL shipping line, as the next Executive Director of the Port of Los Angeles. The Board of Harbor Commissioners will consider Mayor Garcetti's nomination at its June 5th meeting. Seroka's nomination is subject to confirmation by the Los Angeles City Council. "I'm proud to nominate Gene Seroka to be the next Executive Director of the Port of Los Angeles, the nation's top container port," said Mayor Eric Garcetti. 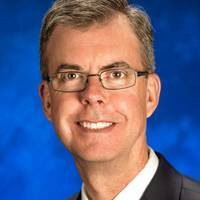 Moore Director Declines Permanent Position at Port of L.A.
Interim Port of Los Angeles Executive Director Gary Lee Moore announced today that he will not apply for the permanent position. After an executive director is selected and in place, Moore will return to his duties as Los Angeles City Engineer. “I’m grateful for Gary’s leadership, particularly for putting the TraPac container terminal expansion project back on track,” said Los Angeles Mayor Eric Garcetti. “It’s been a privilege to lead the Harbor Department since November,” Moore said. Los Angeles Mayor Eric Garcetti announced the launch of a global executive search to fill the the top post at the Port of Los Angeles. Under Mayor Garcetti’s direction, the Los Angeles Board of Harbor Commissioners established an ad hoc search committee to oversee the process, which is comprised of Harbor Commission President Vilma Martinez and Commission Vice President David Arian. 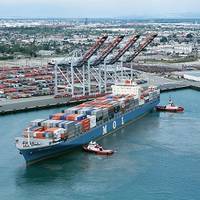 “The Port of Los Angeles is a critical economic driver of our region and plays a central role in L.A.’s reputation as a global city and leading Pacific Rim trade gateway,” said Mayor Garcetti. “The Port operates in a fiercely competitive global economy and international trade arena,” said Board President Martinez. The Los Angeles City Council unanimously approved a 50-year lease to transform a 100-year-old pier on the L.A. Waterfront in San Pedro into a world-class urban marine research and innovation center called AltaSea at the Port of Los Angeles. The lease agreement – signed between the Port of Los Angeles and Rockefeller Philanthropy Advisors, the latter who currently serves as the fiscal sponsor for the AltaSea project – involves approximately 35 acres of land and water at the Port’s City Dock No. 1 site, Berths 56-60 and Berths 70-71. “Public-private partnerships like AltaSea represent an innovative way to encourage investment and redevelopment in our communities,” said Los Angeles Mayor Eric Garcetti. The newly assembled Los Angeles Board of Harbor Commissioners held its first meeting, with four of the five-member panel newly appointed by Los Angeles Mayor Eric Garcetti. Three of the commissioners are Harbor Area residents. The Harbor Commission is expected to elect its president and vice-president at the next Board meeting on December 12 th. 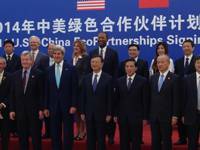 “Spurring investment and creating job opportunities at our nation’s No. 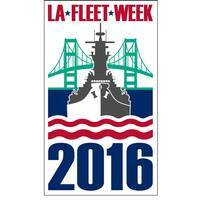 1 Port is critical to Los Angeles and the entire country,” said Mayor Garcetti. 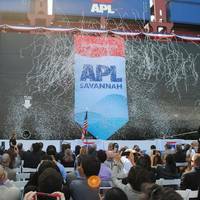 APL has named their new 9,200-TEU (twenty-foot equivalent unit) container ship 'APL Savannah' at the Port of Los Angeles. 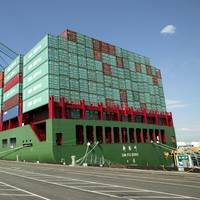 The APL Savannah is the fifth in a series of twelve 9,200-TEU vessels to be delivered to APL, the container shipping arm of Singapore-based shipping and logistics company Neptune Orient Lines (NOL). She is also the first containership to be named and christened at the Port of Los Angeles. “Today, we celebrate our long history of more than 160 years in the US, and our commitment to and investment in the Trans-Pacific trade,” said Ng Yat Chung, Group President and CEO of NOL.